If you read the previous web log post about the EISCAT site at Sodankylä, you may be wondering how a dish fitted with a UHF receiver can receive signals from a VHF transmitter at Tromsø. Well, that's because there is actually a second transmitter at the Tromsø site. As we mentioned in the first post about the EISCAT facilities near Tromsø (Norway), there is a radar there which operates at 931 MHz. 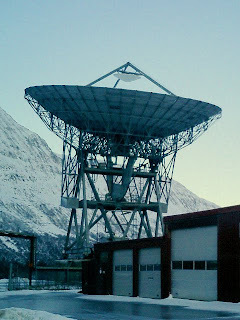 Like the receiver dishes in Kiruna and Sodankylä, the UHF transmitter system in Tromsø is also a 32-metre diameter dish, although of a slightly modified design. This is because of the additional waveguides required by the transmitter, which take the high-power signals from the klystrons in the so-called transmitter hall, out to the dish and then through a couple of rotating wave-guide joints to get it to the focal position for beaming into the upper-atmosphere. Together with the passive receivers at Kiruna in Sweden and Sodankylä in Finland, EISCAT’s Tromsø UHF radar transmitter forms this tri-static system. The UHF system has been operating since 1981, with several major upgrades in the intervening period.